The dreadful question, “what is your budget?” can oftentimes leave you stumped. We understand how difficult answering this question can be. 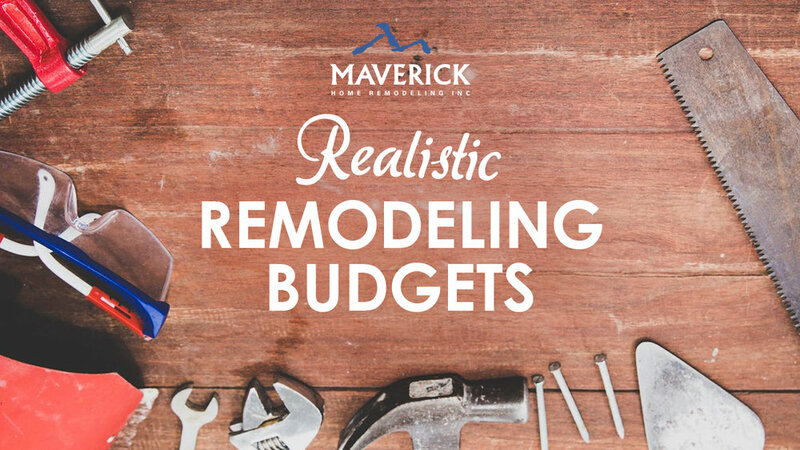 There is a lot that goes into a remodel so being realistic about your budget is key to a successful home remodel. That said, we have pointed out some things to keep in mind when considering your budget. So, what is a realistic home remodeling budget? Our first piece of advice is to talk to a reputable Contractor to understand what your remodeling budget will be when compared to your remodeling dreams. A good Contractor will know the cost of materials and labor for your area, which can vary region-by-region. Taking the time to sit down with a Contractor first will positively impact your overall remodeling experience from budget to execution to finish. Check out our previous blog, “Where Do I Start?” to understand more on working with the right Contractor. Material choices can dramatically impact your budget. Certain appliances alone can cost upwards of $10,000 per unit depending on make and model. Research what you want first so you can accurately prepare your budget and ultimately get what you want. There is nothing worse than envisioning a gorgeous natural stone tile then having to get a lower grade tile because you ran out of money. Understanding what you want compared to what you can afford is very important. And, a reliable General Contractor will be able to assist you with developing your ideal budget. Always anticipate the unknown. Make sure to budget in a buffer. No matter how much you plan, surprises may happen like finding mold behind a wall that needs to be mitigated or a hidden support beam that needs to be moved to fit your design. If your home is older, testing for lead and asbestos will be required to meet EPA standards and then properly disposed pending testing results. Local municipalities will inspect your project and can add requirements in order to bring your property to current building codes, which can also add an additional cost. When planning your budget, be sure to give yourself an additional 5% - 10% to use as a buffer… just in case. Quality. Service. Cost. You can only get two of three… which two is up to you. You can have quality and service, but it will cost you. You can go cheap, but you’ll sacrifice either quality or service or both. You get the picture. Understand that quality and service come with a higher price tag. If quality and service are important, and they should be, plan this in your budget. What exactly do you want remodeled? What room or rooms? Are you changing your floor plan? Are you moving plumbing lines? All of these things will fluctuate the cost of a remodel. Changing things like plumbing, electrical, gas lines and walls will add to the cost of your remodel. More complex home remodeling means that you can expect permit fees and building code costs. Plan for this, especially if you have an older home. Don’t be discouraged, be realistic. A full mater bathroom remodel can cost anywhere from $30,000 - $80,000 depending on the complexity of the remodel. Materials and features really determine costs. So, do your homework and find what you want so you can create a budget. As you embark on your 2019 remodeling adventure, remember to always understand the costs associated with a remodel. When you get asked the budget question, answer feeling confident that you have a realistic budget to give! And remember, have fun and renew your home the right way!